Holmgren, Eric J.. "Harry Edwin Strom". The Canadian Encyclopedia, 15 December 2013, Historica Canada. 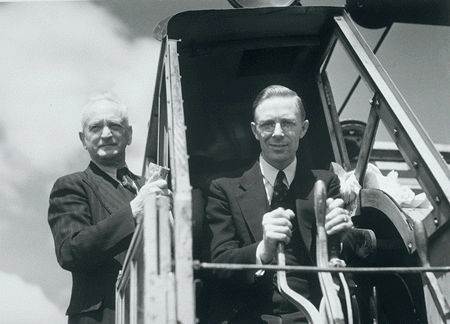 https://www.thecanadianencyclopedia.ca/en/article/harry-edwin-strom. Accessed 22 April 2019. Harry Edwin Strom, farmer, politician, premier of Alberta (b at Burdett, Alta 7 July 1914; d at Edmonton 2 Oct 1984). Strom's parents were both born in Sweden. Harry Edwin Strom, farmer, politician, premier of Alberta (b at Burdett, Alta 7 July 1914; d at Edmonton 2 Oct 1984). Strom's parents were both born in Sweden. He served as municipal councillor, school trustee and chairman of the local Rural Electrification Assn and was also interested in water conservation. First elected to the Alberta legislature in 1955, he was re-elected in 1959, 1963, 1967 and 1971 as a Social Credit member. He served as minister of agriculture 1962-68 and minister of municipal affairs July-Dec 1968 in the administration of E.C. MANNING. In Dec 1968 he became premier on the retirement of Manning but in Sept 1971 the Social Credit government was defeated by the Progressive Conservatives under Peter LOUGHEED. From 1971 to 1973 he was leader of the Opposition, and following the provincial election of 1975 he retired from politics. He was the first Alberta-born premier. He was active in the Evangelical Free Church.